Turn spoken sounds into words with a rainbow-bright learning pack. Building up reading and spelling skills through tried-and-tested phonics methods, it lets you master all the alphabet letters – and learn the sounds they make! Inside this pack you’ll find a wipe-clean board book full of easy exercises, plus beautifully bright flashcards for practising each sound. You can develop pencil control through tracing and writing activities, and decorate your things with colourful stickers. Mistakes? Just wipe them clean and start again! 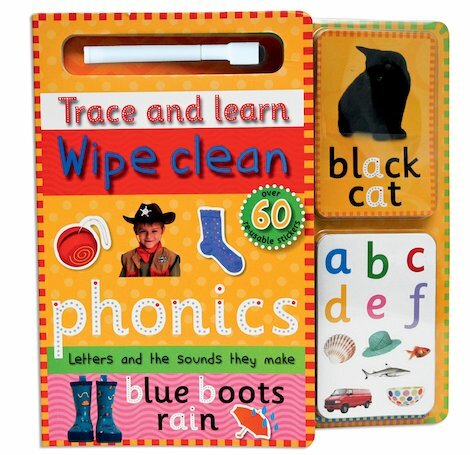 Includes a wipe-clean book with practice flashcards, reusable stickers and a wipe-clean pen and sponge.